Sunday - The Finish Line! Every June, we are all on a buzz for a number of weeks after the event. During the subsequent months the high tends to diminish. It is now time to start gearing up for this year’s challenge. 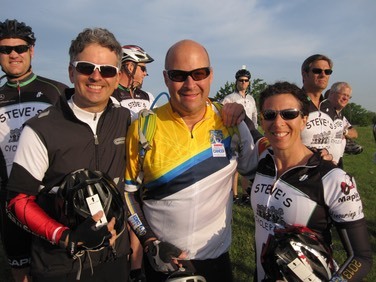 We remain committed to using our bikes as a vehicle to finding the cure to this deadly disease. To date, we have approx. 200 people signed up for 2015’s ride. This is significantly behind our pace of previous years. The event will be sold out within a matter of weeks. As in the past, numerous people who we know are going to be joining us this year just haven’t gotten around to filling out the forms. It makes our job of planning significantly easier if we know the numbers sooner than later. In previous years the ride has allowed us to reserve extra spots. This year they are putting pressure on us to fill them or lose them. Attached you will find a sign up form and a team list of those whom have already signed up. Please check to make sure your name is there if you’ve already signed up and pester your buddies who haven’t registered yet to do so. The 2015 start line in Toronto has moved from Ontario Place to Humber College in South Etobicoke (Kipling/Lakeshore) area this will cause many of us, especially the out of towners some new challenges. Since we already have a block of rooms at the Novotel, and there are no hotels at a reasonable distance in this area we are thinking of continuing to stay at the Novotel and have buses take us to a staging area 1 – 2 kms away from the start line. The trucks bringing our bikes from Niagara will meet us there. We anticipate traffic getting to Humber College to be a nightmare and will be encouraging our Toronto area riders to meet us at this off-site staging area. We are currently looking for a location in the Sherway Gardens area. More details to follow in the coming months. In previous years a number of our riders returning to Toronto with their bikes have had many challenges. We are exploring the possibility of arranging a bus and a truck to take riders and their bikes back to the staging area near the Humber College start line. There will be a fee for it, but it is yet to be determined until we know final numbers. Our anticipation is that it will be in the $30/35 range. If we are successful in arranging this, riders can drop their car at the staging area, leave them for the weekend and return on Sunday afternoon via bus with their bikes and pick up their cars. . Please let Jacqueline (joscvirk@salitsteel.com) know if you are interested in this option. As usual, we will be providing the usual buses to Toronto from Niagara Friday afternoon, shuttles to/from the Sheraton in Hamilton and shuttles from the finish line back to Salit Steel after the event. This time of the year you should be spinning or riding on a trainer 2 – 3 X per week, 30 – 45 minutes minimum. In our follow up newsletters, we will provide more detailed training tips. Start now, or pay later. As in the past we will be having our Steve’s Cycle Path’s Team Kits. The advertising on the Team Kits is paid by our sponsors who last year raised more than $20,000. These funds go to defray the cost of the Team Kits, pay for some of the weekend’s expenses and assist some riders in helping them reach their goals. There is still Sponsorship spots available and contact me if you are interested. The deadline for ordering the Team Kits is April 8th and more information will be released shortly. If you have any questions, please contact Dave Winckler directly. As in previous years we have booked blocks of hotels in downtown Toronto and Hamilton. We will not be releasing either block until late March. Details will be provided on how to reserve as we get closer to that date. Past experience has shown us that those who start early have less trouble reaching their goals. As our team grows and our network is more intertwined, this becomes even more important. Don’t wait, start now. Each of us should strive to raise our personal goals by 10% over last year. Although Steve’s Cycle Path’s premier fund raising cause is the RTCC we have put teams in support of other charitable causes. If you wish to organize a Steve’s Cycle Path’s presence in upcoming event, please let us know and we will include it in our upcoming newsletters and post it on our website. Saturday, February 21st at 10:30 a.m. The Niagara YMCA Strong Kids Spin-a-thon Event for details and to register or see details go to www.ymcaofniagara.org and click on YMCA Cycle for Strong Kids. On Saturday, April 18th at 8:30 – 3:30 p.m.
Steve’s Cycle Path’s will be having a Spin-a-thon in St. Catharines. To help raise awareness of the RTCC, our team and to raise monies for those riders that may struggle to raise the minimum. We are looking for 30 volunteers to both spin and collect $$$ during the event. Contact Dave Winckler if you are interested in participating by emailing stevescyclepaths@gmail.com. Given the frigid weather outside it’s hard to believe we’ll be riding outside in 6 weeks. Despite the weather, it’s time to get pumped. Try and visualize the euphoria of the weekend and let that be the driving force to get you motivated while we are training and finding us more riders.